Below is the beginnings of the Chama River valley. We were driving southwest towards the city of Mérida. This was about 20 kilometers from the Paso Pico El Aguila. 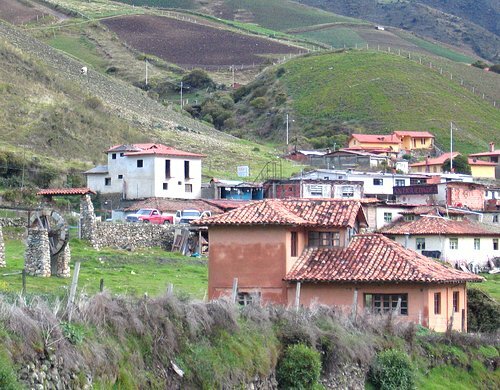 A few miles up the road from Muchuchíes after coming out of the mountains is San Rafael Mucuchíes. 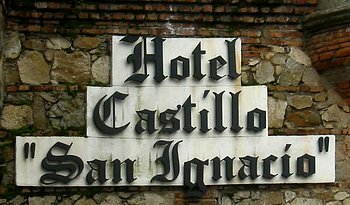 It was founded in 1872 by Father Asuncio'n Leon. 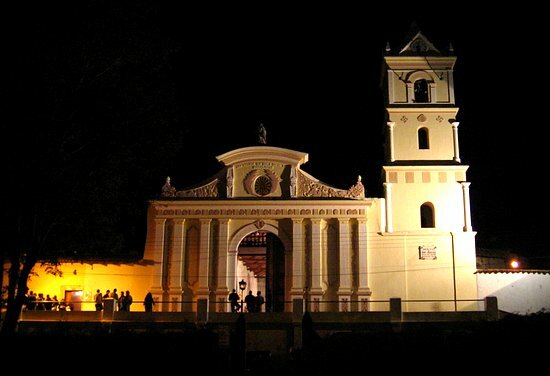 It was originally called San Rafael Arcángel, but later San Rafael de Mucuchíes. 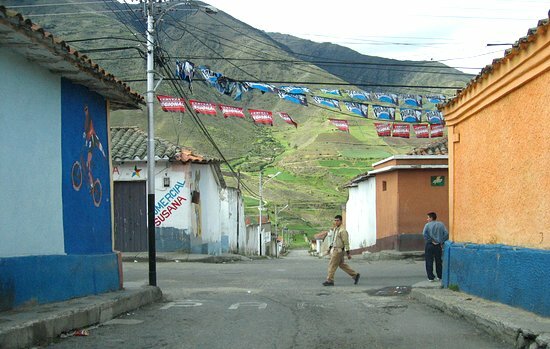 The town currently has a population of about 600 people. 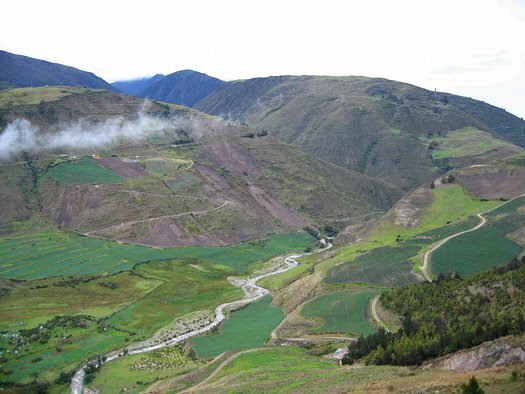 It is the highest inhabited point in Venezuela at 3140 metres (10,300 feet) above sea level. 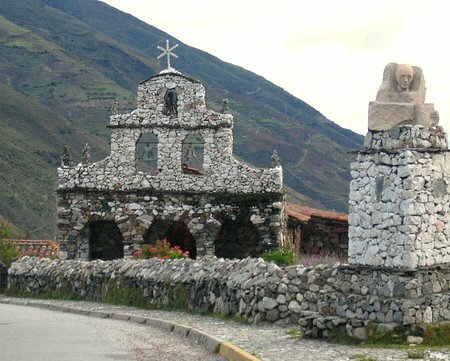 At the northern end of town was the chapel of stone dedicated to the Virgen de Coromoto. 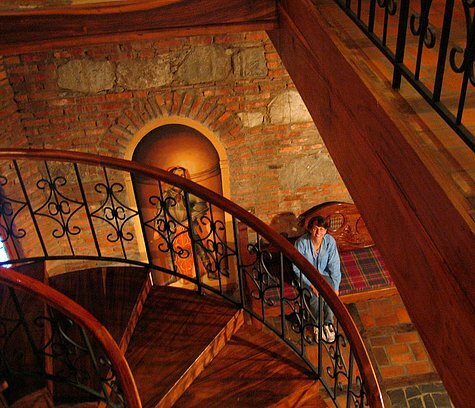 The Capilla de San Rafael de Muchuchíes was created and constructed personally by the "self-taught architect of The Andes" Juan Félix Sánchez, born in 1900, and who died in 1997. He is buried inside, but the building didn't kill him. He was in his seventies when he built everything. The place was actually a whole complex consisting of a church, two chapels and a plaza. 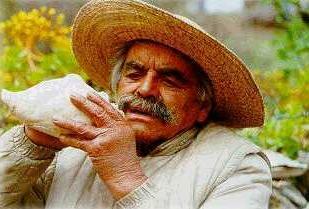 Juan. I'm not sure why it looked like he had his hand stuck in a conch shell, but it looked like it hurt. What on Earth was this place doing here?? 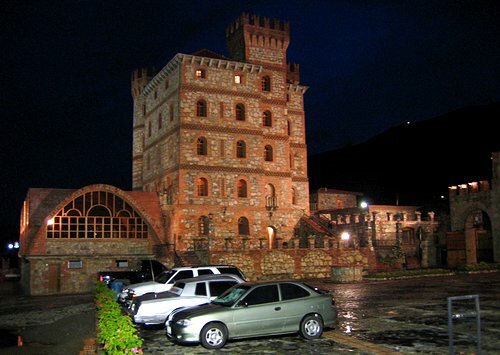 A hotel like this in the middle of nowhere in Venezuela. It begged to be stayed in. This was in Muchuchíes. 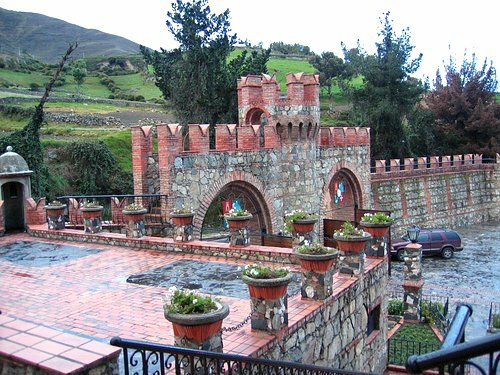 It looked old, but the castle had been built in 1986. The ceiling brickwork down in the bar. This was almost as good as some of the work I saw in buildings in Italy. 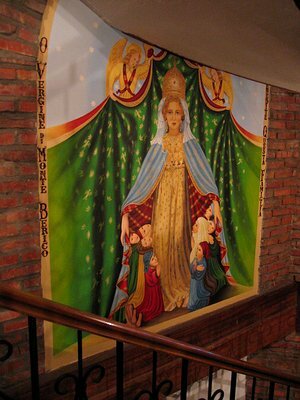 There were several large wall paintings around the central staircase. There were a lot of large pieces of wood in the castle. I'm not sure if they were real hardwood planks and beams or just a veneer of some sort. It was pretty, but it all almost looked fake. This was a small courtyard out the front door that probably gets more use when the weather is warmer. Beyond that is the entrance to the parking lot. 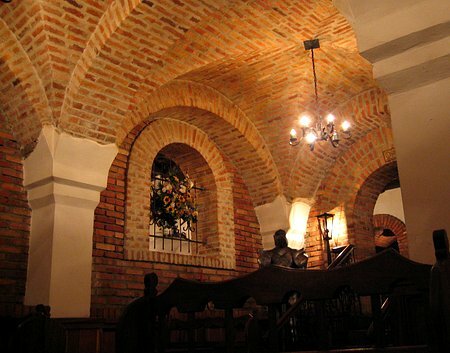 In addition to just being a hotel and restaurant the place also had a large reception/meeting room which was what the arched windows were a few pictures back. The prices were extremely reasonable. I think it was the off season. The church across from the plaza, below, was quite nice. There was also a medical center opposite the plaza that was kind of busy. The town was founded in 1596 on the site of a pre-colonial village. The name Mucuchíes means "Place of Cold" in the indigenous language. The statue in the Plaza Bolívar , appropriately, was partly dedicated to the Muchuchíes dog. The statue was of a young Indian, Tinjaca, and his dog Nevado, which means Snowy. 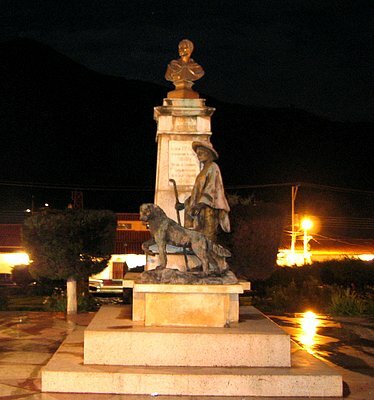 According to legend Simón Bolívar stayed in the town of Mucuchies and the boy and his dog joined his forces. Both the boy and the dog were shot dead in a fight defending Bolívar. Another story says that the dog awoke Bolívar in his tent two hours before a surprise attack saving Bolívar from being killed. In 1964 the Mucuchies breed was designated as the national dog breed of Venezuela. The breed is used as livestock guard dogs. Right after I took the picture below a heavy fog started rolling in. Hmmm. What more do you need? Actually, this place was hoppin' with people when we drove around and stopped at the Plaza the night before.